In the spirit of the holiday season, and in keeping with Krista’s wishes to “feed those in need”, Kiki’s Garden spread a little sunshine with a donation of $250 to the Exeter Food Bank. 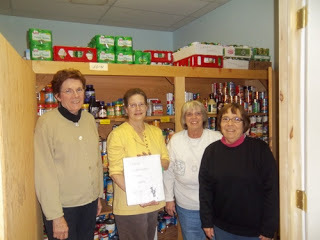 Director Silvia Curry accepted the donation along with several of her dedicated volunteers. Pictured from left to right… Kate Conroy, Silvia Curry, Joan Briggs and Joanne Walsh. We thank them for the good work they do in their community!